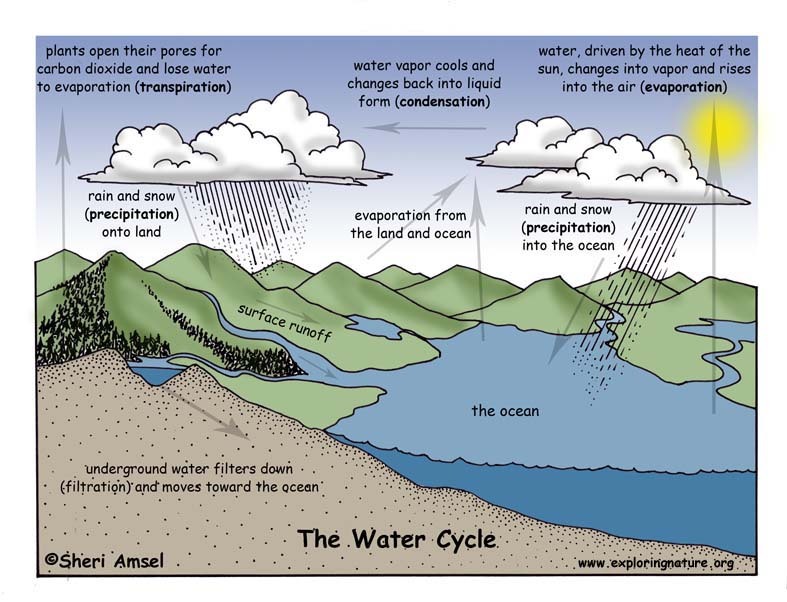 The water cycle renews our valuable water supply on Earth. We have kept roughly the same amount of water on Earth as solid ice, liquid rain and gaseous water vapor throughout time. It continually cycles and moves from the ocean, polar ice caps, rivers, lakes, wetlands, snow, underground aquifers and water vapor in the clouds. 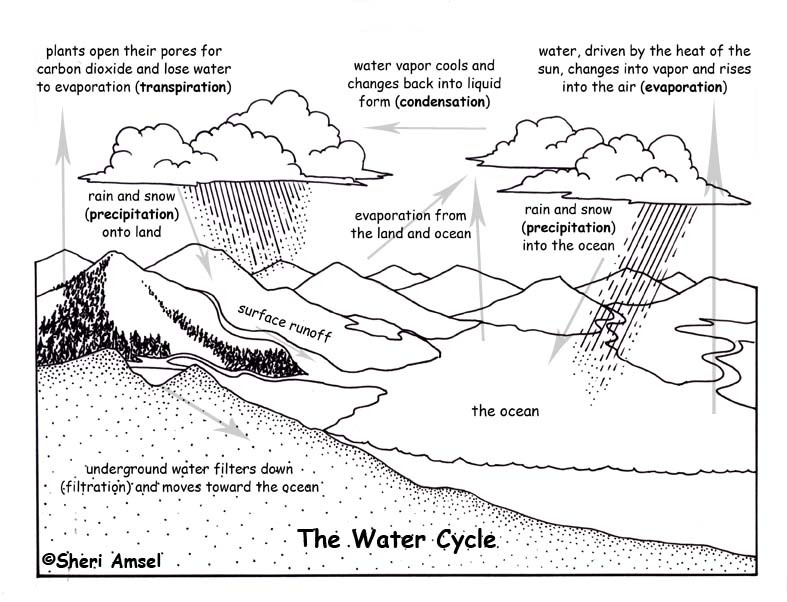 The water cycle is driven by the sun, which evaporates the water on Earth to rise as vapor. It then cycles back to earth as rain or snow and starts all over again. To follow the water cycle you can start in the ocean, which stores more than 95% of the Earth’s water. 1) Water, heated by the sun, evaporates up from the ocean and other waterways to form clouds in the sky. Some water evaporates from plants (transpiration) and a small amount evaporates directly from glacial ice (sublimation). Without this vital cycle, there would not be life on Earth as we know it. 2) The clouds gather all the tiny water droplets together until they are big enough to fall as rain or snow. This is precipitation. Precipitation falls much more in warm tropical places than in deserts. In colder places precipitation falls as snow. 3) When rain falls on land, it soaks into the groundwater and runs into rivers and streams, on their way to the ocean. Here the cycle starts all over again! To make black an white copies for your whole class, see the copy-friendly version below.